Tells the story of the Third London Airport Campaign 1969-1971 when the eyes of the whole of Britain were on the villagers threatened with eviction and the destruction of their homes. of three local filmmakers, and the BBC. OVER OUR DEAD BODIES DVD ... took the award for the best use of archive footage in the Home Video/DVD category of the 2010 awards of the worldwide stock and archival footage industry hosted by trade body FOCAL International. The FOCAL awards, sponsored overall by the AP Archive, were announced at a glittering ceremony at London's Lancaster Hotel, where guests included Melvyn Bragg and movie director Martin Scorsese. Over Our Dead Bodies was up against two American productions, nominated from the eight programmes submitted in the category. 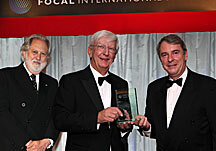 Stewkley Film Archive founder John Flewin (centre) with the award. Left of picture, tv producer Lord David Puttnam, and on the right, Jean-Luc Vernhet, an executive of INA, the French national audiovisual archive, which sponsored the award. collection of the late Tony Greenslade and others. "Great Night. A wonderful insight for future generation"
"It was great fun going back down memory lane. Great footage of 1990 May Day"